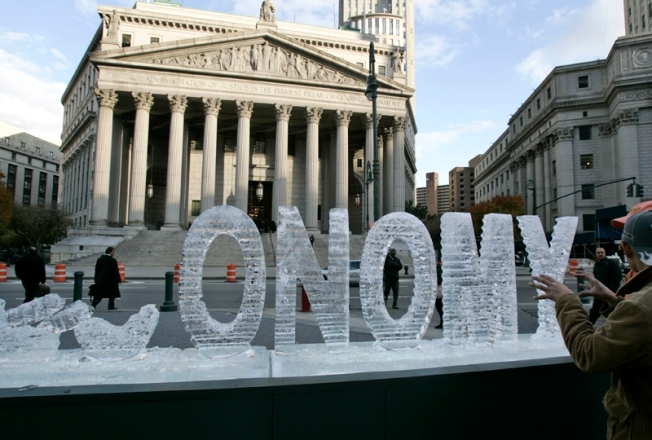 An ice sculpture entitled 'Main Street Meltdown,' is melting on the 79th anniversary of Black Tuesday, the stock market crash that caused the Great Depression, as pedestrians pass by Wednesday, Oct. 29, 2008 in New York. The sculpture is the work of artists Nora Liganno and Marshall Reese and is the fourth in a series addressing political issues. With a new administration will come a new complexion for the stock market, and investors in alternative energy, technology and infrastructure could be among the biggest beneficiaries. While the market has been anything but predictable in the era of fear that has gripped Wall Street over the past year, a look at President-elect Barack Obama's priorities provides a glimpse into what should be the movers and shakers on Wall Street. Who Will Be the Next Treasury Secretary? In a broad sense, market pros see public enthusiasm over the Obama White House combining with a severely undervalued stock market to generate at least a bit of a sustained relief rally. "I think it's a great day for America, and believe me that cannot be bad for the financial markets," Jack Bogle, founder of The Vanguard Group, said on CNBC this morning. Yet Bogle wasn't unbridled in his optimism for the path ahead, signaling that investors still need to be cautious about where they're placing their bets. "I'm feeling a lot better about the market," he said, but added, "I'm feeling concerned about the economy, because what goes on in our economy hurts real people." See Bogle's full comments in the video below. It all adds up to a tricky investing climate ahead that is inspiring some conflicted feeling from market analysts. Obama's energy policies, which likely will emphasize alternatives like wind and solar and turn away from fossil fuels, will be one of the biggest factors in playing the market. Interestingly, some of the biggest names in alternative energy were getting clobbered in trading the day after the election. But that could well have been because they had such a huge run-up in anticipation of an Obama victory that there was bound to be some downdraft following his win. In fact, some were attributing Wednesday's overall selloff as just another chapter in the buy-the-rumor-sell-the-news trend in the market. "The selloff today has nothing to do with Obama. We've moved up 19 percent from the bottom," says Dave Rovelli, head of US equity trading for Canaccord Adams. "This is just some profit-taking." Rovelli sees alternative energy as a good play going forward to cash in on the new administration's emphasis on green technologies. Indeed, leaders in the sector including Suntech Power (NYSE: STP) and First Solar (NASDAQ: FSLR) gained more than 50 percent in the week prior to the election, before tumbling Wednesday. "We don't own too many energy stocks in general. They had such a huge runup last year," says Mike Burnick, director of research at Weiss Capital Management. "I think you are going to see some interesting opportunities in solar and wind power." Natural gas also is expected to benefit, with Chesapeake Energy (NYSE: CHK) among the leading companies. "This administration will be very favorably inclined to try to do something about introducing natural gas into the transportation network in a more aggressive way than what has happened in the past four to eight years," Chesapeake CEO Aubrey McClendon told analysts last week. Pharmaceutical companies in particular are the subject of some debate: Will Obama follow through on a tenet in his health care plan that will cap how much drug-producers can charge for their products? Or will such dramatic initiatives have to wait while the new president fixes the economy? Count Burnick in the camp that thinks drug stocks present significant value to investors. "Health care certainly has been a favorite sector of ours for quite a while, not just because of the obvious demographic trends but because health care has been out of favor for the past 10 years," he says. "Even after the health care bubble burst it was still in the doghouse for some time." He likes industry leaders such as Pfizer (NYSE: PFE) and Johnson & Johnson (NYSE: JNJ) to lead the group back. Burnick says any major changes to health care probably will be delayed and may already be priced into the market. An Obama victory also could get consumer confidence out of its doldrums and help a variety of sectors. "The good news is the American public got the change they wanted yesterday," says Peter Miralles, president of Atlanta Wealth Management. "Consumer confidence is at all-time lows. We should see consumer confidence start to rise here, at least during the honeymoon." Any consumer strength likely would spill into technology, which has suffered as much as any sector during the current downturn. But Rovelli, who focuses on the sector for Canaccord Adams, advises a measure of caution from investors who may be lulled into thinking the market has formed a long-term bottom. "I wouldn't chase stocks. I would wait until we have a really nice move, if they come back in again to the Dow at 8,000, the S&P at 850," he says. "Nothing's changed in the overall big picture, so I would definitely wait to see what happens from here. If the market comes in, revisit names that don't have a lot of debt and give decent guidance." Which Energy Stocks Will Get Obama Boost? Some of those names could include Intel (NASDAQ: INTC) and International Business Machines (NYSE: IBM), which Burnick sees as winners once the economy comes off its low point. "You've got a sector way out of favor since 2000 that's still only recovered about half of what it lost," Burnick says. "These are companies that will do well just in general as the economy recovers and whatnot." In addition to fossil fuel companies, industries that could fall out of favor include defense contractors, while skepticism continues to reign about financials. Military aircraft leader Lockheed Martin (NYSE: LMT) has seen its shares tumble about 25 percent over the past two months as Obama's political stock rose and culminated in Tuesday's victory. Bargain hunters may have stepped in to give shares a small boost the day after the election, but Obama's predisposition against defense spending likely will be problematic for the industry. Boeing (NYSE: BA) also is a key military supplier, and its shares stumbled Wednesday. In financials, continued credit issues and weakness in housing might provide a weight on that sector. "I do think there's a lot of risk still in this market today," James Shelton, chief investment officer at Kanaly Trust, said on CNBC. He said one of the keys to preventing further market turmoil will be how well Obama chooses his Cabinet members. "What he's got to do here in the coming week is he's got to bolster confidence in the market with some very good appointees, particularly for Treasury," Shelton said. "There's this perception that we saw this big rally in financials and that the worst is behind us," Burnick adds. "That actually may be true for some of the Wall Street firms, but I don't think you're going to get back anytime soon to normal operating conditions for financial stocks." As such, investors will have to do their homework to profit from the Obama administration and look for what sectors will drive the economy out of recession. "In every bull market you're going to see market leadership, and we haven't established that yet," Miralles says. "I think we have to operate as if this is not the beginning of a bull market."